Do you wave at Motorcycle police officers? 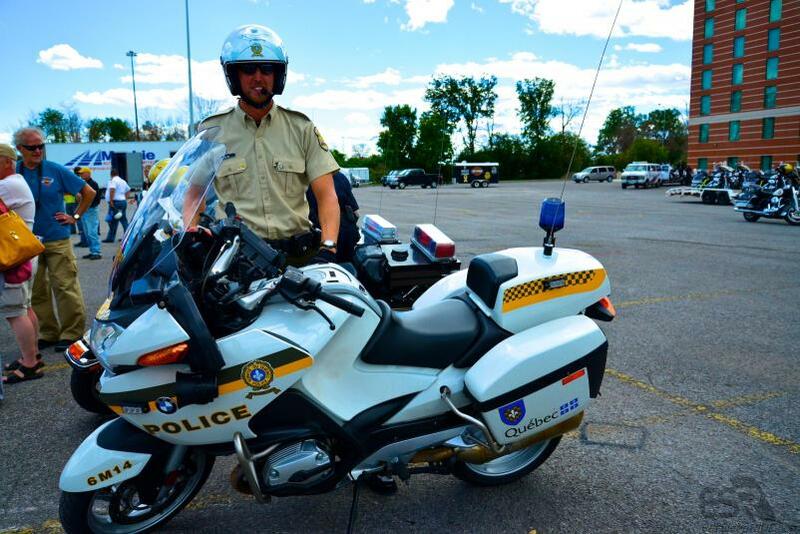 The question... do you/should you wave a motorcycle police? On one hand, they are just people and they ride bikes... on the other hand they are "The Law". Re: Do you wave at Motorcycle police officers? Wave? Probably not. If I'm in riding in traffic and see a motor officer I'll try to follow him or her as they split lanes - its fun to watch cars move out of the way to provide more clearance. And if in a motor cop's sight line while riding, I'll acknowledge them. I don't think they would wave back. CJS, definitely agree about following CHP bikes on the freeway. Did a 30 mile stretch up the 405 behind one. It was great, like the parting of the Red Sea. I've waved at 4 bike comes who were coming towards me in the opposite direction, and one who was making a left turn in front of me. Batting .500 for a wave back. What reason would you have for NOT waiving. they're people too, and bike riders. I wave at all on two wheels, including scooters and bicycles. If traffic is bad, I don't look to see if it's returned. But I still wave. Unfortunately here in Australia the days of a good cop, and the chance of getting a warning are all over. They are video recording and sound recording everything and have a quota of tickets to write on their shift. I'm not waving at them, they can go and get fkt. May seem a bit harsh but that's the way it's gone here in NSW Australia, Victorian police are worse apparently. Monday I was on a ride and saw 2 motorcycle cops coming towards me, I waved they did not so I gave the 1 finger wave as they went by....later in the day I saw another motorcycle cop, he was first to wave but it was more or less hidden, just off the hand grip, but hey, that is acceptable for a cop. of course I waved back! Oink oink oink,..thats pig talk for, of course not. I wave, why not? And by and large I'll get a wave or nod back . Maybe the PoPo are just more friendly in Oklahoma. To date, I've never been stopped or given a ticket by a police motorcyclist, albeit I typically get at least one speeding ticket per year. No big deal, I'm not going to hold a grudge, it comes with the territory, I'm a speed freak and accept its part of my fun. Ultimately I probably get a warning two times for every one time I get a ticket. In most circumstances I do. Each time I get caught speeding they have been very polite and several have been quite sympathetic.I always take my helmet off so they can see I could be their Grandfather.The time before last several months ago when caught 15 kph over I received a caution which saved me over $400 . Always wave and pretty much always get a return acknowledgement of some kind. Many times, I don't realize it's a cop at first, but it doesn't matter. They've always been polite & then "chatty" about my bikes when I've been stopped. Of course the bike talk was after the warning or the ticket. I don't see many around here but I'd much rather wave to a guy who rides everyday for a living than some of the leather fringe wearing guys who only take their bikes out of the garage to ride to the bar. That being said I'm pretty much an equal opportunity waver. the last wave I got from a cop was when I was riding on a 4 lane road early one morning, not really any traffic at all, beautiful sunny morning at that, I round a curve and there is a policeman standing next to his car in the right lane "waving" me over.....oh crap, so I pull over and start to remove my helmet and he says, "the fact that you even stopped is good enough for me, slow it down, okay? ".....so I respectfully wave at every opportunity! I wave. Especially to the Coppers standing around their radar captured victim, thankful it was not me getting the evil eye. I wave to all two and three wheelers. They are pretty much facing the same issues I am. I only get about 1 in 5 CHP wave or head nods back. I get about a little more than half returns from most riders. It's a community. It's fun, one of the many reasons I ride. I've been followed and have followed CHP splitting lanes going home. CHP was doing his job and checking people for phone use (from what I could tell). I slowed down and stayed back and let him do his job. I also usually see one CHP MC the opposite way going to work. But we have a big wall between us. Not many wave in general on the freeway. I wave, and more often than not, they either wave first or at least wave back. Hey!! Rob, you could have stopped with your lovely bride AS he was ticketing me for at least 30 under what he clocked me....after I scrubbed off at least 20. But noooooo, instead of having Linda tell the cop in her melodious Scottish voice "officer, you smell good", you just waited for me & we 3 had lunch together - thanks!! If they're wearing full protective gear in 100^ heat (like I do), instead of "promoting" that "my short sleeve shirt & puddy pants" are road rash resistant, the "I'm setting a proper example for all riders riding around like this" mentality...then Hell No, ain't gonna give the ego boost they think they need. One of the MAIN REASONS not to acknowledge, is this sort of "behavior", when, by all accounts, it's STRESSED to wear protective gear ALWAYS!!! What, they gonna let ya get your MC endorsement at the DMV or MSF school ride'n in a polo shirt, and jeans?? I put two fingers out ( peace ) and retract one if they don't reciprocate. I was on a mountain ride a few years ago. I went around a corner and saw the local sheriff on the side of the road. Like a good biker, I saw about 7 bikes coming up the hill and gave them the tap on the helmet. When I got closer I realized it was the CHP lead with a bunch of cadets following. I stopped my tap and they mistook it as a wave and countered. Ha. Where I live in Ohio, Motorcycle police officers are very rare. So I do wave to them like all other riders and then notice they are cops....and I would wave anyway! The unit that I work in is responsible for the training and skills updating of the Queensland traffic police. I am in awe of the skills of these guys after attempting the course. (for fun). The rider's slow/high speed ability is astounding. I could not complete the course without a LOT of practise. The bikes are FJ1300s and Honda ST1300s and are heavy as Tammy Faye Baker's eyelashes (380 kg- heavier than an HD Road King). They are generally a good bunch of blokes but on the road? I don't know, I haven't been pulled over for many years now. Haven't been pulled over (knock on wood) by one yet. On the other hand, why would they? I wave at everyone. End of story. And I don't really care if people wave back, that's on them. Blow it up so we can get a good look at him! I give them a nod, which is the accepted form of acknowledgement in the UK, and they usually nod back.